In a battle between the two countries that produce everything except great starting pitchers, Puerto Rico jumped ahead with first inning homers by Carlos Correa and Enrique Hernandez. 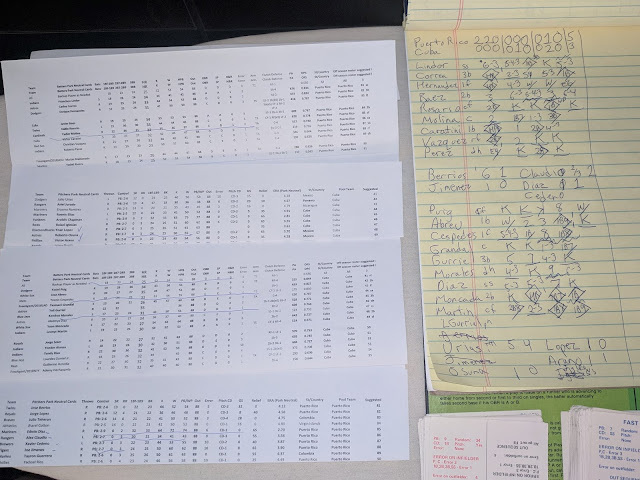 However, they barely survived when 7 of the last 18 batters came up with hits including a pinch hit by Lourdes Gurriel Jr. followed by both Yasiel Puig and Jose Abreu driving Clutch Batting would be 3-run homers foul to fall just short 5-3. Learn to play Statis-Pro Baseball in 5 minutes by clicking here. The silver lining for Cuba is that because they were playing from behind they will still have Aroldis Chapman, who projects to be one of the best relievers in the year with a PB2-9 based on a projected 2.81 ERA if he had average fielding and an average park behind him. Puerto Rico and Cuba have by far the worst starting rotations of the six international teams, with a 4.56 and 4.61 projected overall ERA and none of their four starters are even an above average PB2-7, so both will need to hit to compete in this league. Obviously, Venezuela is at a disadvantage in this opening series as they are projected as the 2nd best team but facing the favored Dominican Republic in their first series.